It took a while to finish all the posts about India, but now it’s finally concluded. Here’s the course of my trip plotted on a Lonely Planet map. Hope you enjoyed it all. Thanks for sharing your journey. 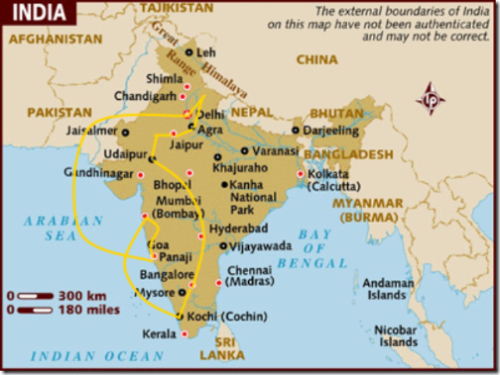 I stumbled onto your blog while I was searching for info about a possible trip to India. I learned much more from you blog about traveling in India than I have from many of the backpackers blogs on India travel. Thank you. I must ask, if you were just visiting India for just a short trip, after all that you have seen, where would you recommend? Bryan – depends on what you’re looking for, but when it’s relatively cold, I’d go to Goa and southern India. I enjoyed it more than I did with the history of northern India.